We are one of Canada's premier insurance litigation firms. With over 35 years as a firm, Dutton Brock has the collective knowledge, experience and expertise to achieve practical, effective solutions to the most complex insurance litigation issues. Our work crosses the spectrum of insurance litigation. We have been widely recognized for our excellence. Lexpert lists Dutton Brock as the most frequently recommended commercial insurance litigation firm in Canada. 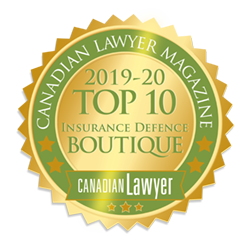 And Canadian Lawyer Magazine has named us one of Canada’s Top 5 Insurance Defence Law Boutiques. Great work has other privileges too. We enjoy what we do and the people we do it with. We are fortunate to have many exceptional long-standing relationships with both clients and colleagues. Our lawyers are pleased to offer their services as Mediators and Arbitrators with respect to insurance disputes. If you wish to book an appointment, please contact the lawyer directly. You can find more information about each lawyer – including their arbitration decisions – on their lawyer bio page.